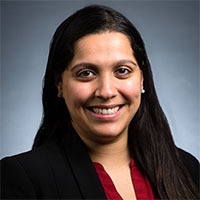 Manali Bhave, MD, is Assistant Professor in the Department of Hematology and Medical Oncology at Emory University School of Medicine. Board certified in medical oncology and internal medicine, Dr. Bhave specializes in breast oncology. She will begin practicing with Emory Healthcare in September 2018. Dr. Bhave holds professional memberships with American Society of Clinical Oncology and American Society of Hematology. Dr. Bhave completed her Medical Degree at Northwestern University Feinberg School of Medicine in Chicago, Illinois, where she also completed her residency in internal medicine. She completed her fellowship in Hematology and Medical Oncology at University of Michigan Health System in Ann Arbor, Michigan, and was Chief Fellow in her final year.